Launched at the International Maritime Organization, the reports identifies that the current shortfall stands at 2.1%, amounting to some 16,500 officers, while some officer categories are in a really short supply, including engineer officers at management level and officers needed for specialised ships such as chemical, LNG and LPG carriers. Although the global supply of officers is forecast to increase steadily, this is predicted to be outpaced by increasing demand. In the past five years the industry has made good progress with increasing recruitment and training levels and reducing officer wastage, as the report estimates that there is a current surplus of 15.8%, about 119,000 ratings, with demand only having increased by about 1% since 2010. However, unless training levels rise, a shortage in total supply of officers could emerge. 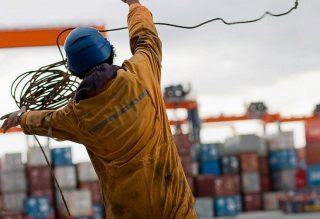 “Without continuing efforts to promote careers at sea and improve levels of recruitment and retention, the report suggests it cannot be guaranteed that there will be an abundant supply of seafarers in the future,” ICS Secretary General, Peter Hinchliffe, said. China is thought to have overtaken the Philippines as the largest single source of seafarers qualified for international trade. While data from international shipping companies suggests that the extent to which Chinese seafarers are available for international service may be more limited, the Philippines and Russia are seen as equally important sources of officers, followed closely by Ukraine and India. The Manpower Report should act as a wake-up call for the industry to address the issue of the accelerating shortage of seafarers, according to InterManager. “Our people are our assets and we need to develop a strategy whereby shipping is once again seen as a career of choice for tomorrow’s young talented people,” InterManager Secretary-General, Kuba Szymanski, said. “There is no avoiding the fact that the global fleet is increasing and more manpower is needed. However, we are demanding more from current seafarers rather than recruiting even more cadets into the market. And these cadets need training berths on our ships if they are to fulfil their true potential. Attracting new seafarers and retaining them will test the industry, but we are taking action now with initiatives such as the single window, paperless shipping and project MARTHA to address this issue,” Szymanski added.